A few short months ago, I remember the big stink made about Miley Cyrus’s performance on MTV’s video music awards. Miley spent days blowing up my Facebook feed. We hadn't watched the awards, so I missed it. I was super curious what all the commotion was about, so i searched for it. It didn't take much searching at all to find it. I watched it in shock, with my mouth hanging open. My first thought was she was obviously high. Between the outfit, the hair and the performance I just couldn't wrap my mind around a sober person doing any of it. Sadly, she was sober. It was a sexually charged performance, to say the least. Fast forward to today...my feed is being blown up once again, this time by Phil Robertson. Now, in this household, we are lovers of Duck Dynasty. They love God, guns, country, truth and they are silly. Sounds pretty similar to our fam. Not to mention their beards, which my husband also sports. I have to say, what I read in my news feed today made me extremely sad. It's a sad, sad world we live in when Miley Cyrus gets a laugh for grabbing her crotch (among other inappropriate things) but Phil Robertson gets suspended for stating his beliefs. Miley’s performance immediately came to mind today while I was reading the horrible, demeaning comments directed to Phil. We live in a society that is more accepting of a young woman gyrating all over a stage, making obscene gestures and acting crudely than we do a family man wanting to remain true to God and his beliefs. 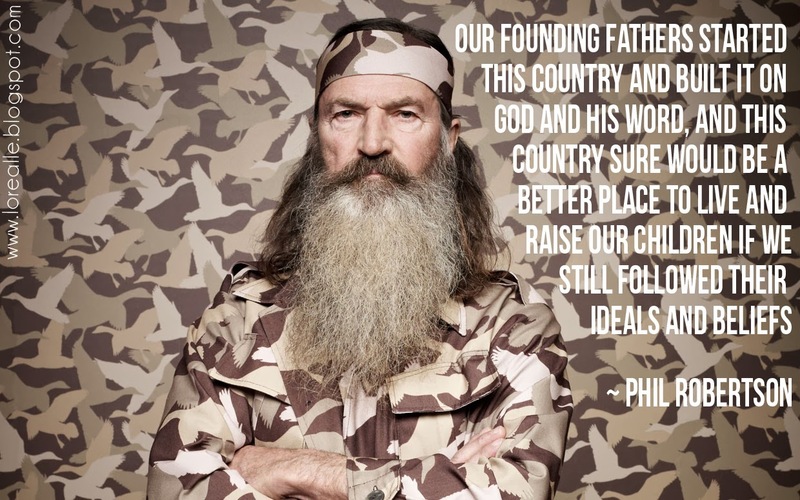 So, Phil Robertson has different views from other people. And? Don't we have freedom of speech? I get so confused why freedom of speech only seems to be directed to other groups and not Christians. An opinion that differs from yours doesn't mean you should hurry and grab your torch and pitchfork. Everybody should treat everyone else with respect, no matter what their views on life are. Period. Sadly, some people will never treat others with respect, because they believe in something different. Phil said he would never treat anyone with disrespect just because they are different from him. Oh, wait, that wasn't one of the quotes the media zeroed in on, was it? He also said we would be better off if we loved God and loved each other. Why aren't these quotes circulated by the media? It’s time y'all, time for us to take a stand for Christ. Take a stand for the world we want to live in. God created you and I to have specific roles in His unfolding story. God didn't create any of us to stand on the sidelines and watch the story unfold; He created us to be center stage. 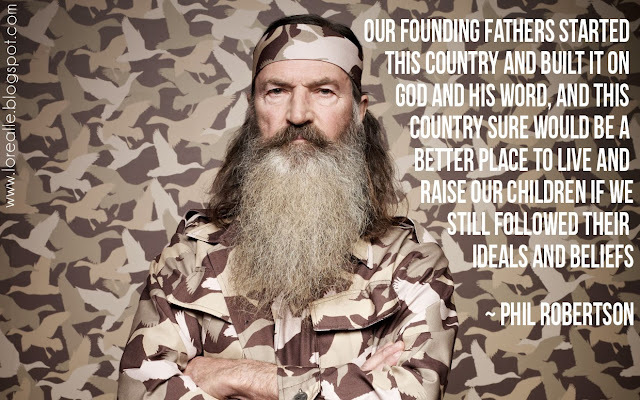 As for this household, we will stand with Phil and more importantly, with God.